Do you know where you can learn a bit more on NAPLE’s history from the very beginning? 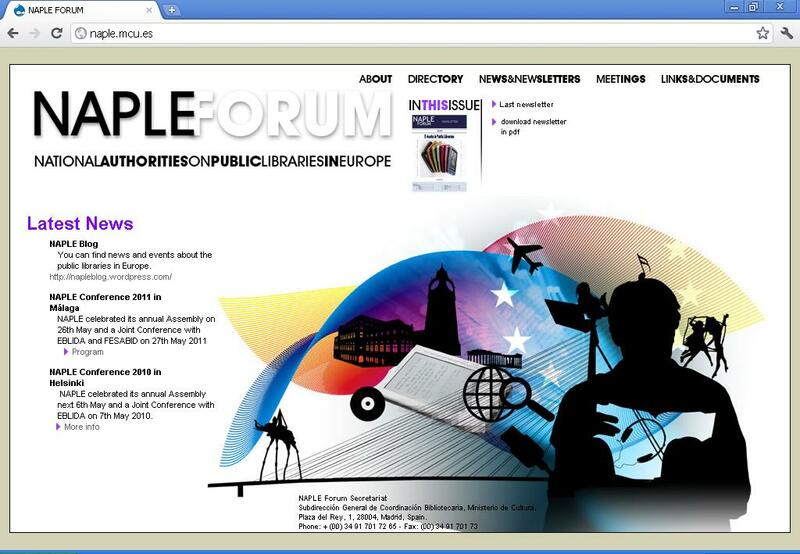 NAPLE’s website holds an archive with all the minutes since the founding of NAPLE and some of the papers presented every year. The Municipal Library of Prague is the coordinator of the new project “Prague, the Town of Literature”. Its drift is to support a perception of Pragueas the place inspiring to literature production, reading and relationship to books. The project is financially supported by the city of Prague. 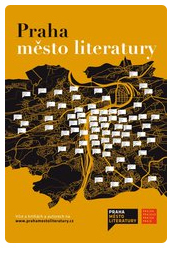 A campaign in the streets prepared for this autumn contains extracts of related text in showcases in the streets of Prague, literature trails and other similar activities. Huelvatecas, a pun on Huelva and the word Bibliotecas -libraries in Spanish- is a blog for library professionals, focused on the latest news on librarianship in Huelva. The State Public Library Ánxel Casal in Santiago de Compostela, Galicia, is organising for the first time a Bibliomercado –word made of Library and Market- in a central location of the city, where the market is situated, on all Saturdays of September and October. The aim of the initiative is to outreach to people at one of the main people concentration areas in the city, providing them with information on the library services and collections. This is part of a larger project, as the library will also be present in other places of the city, like Plaza Cervantes. This action is part of a global context whose main objective is reading promotion in cooperation with the bookseller sector. 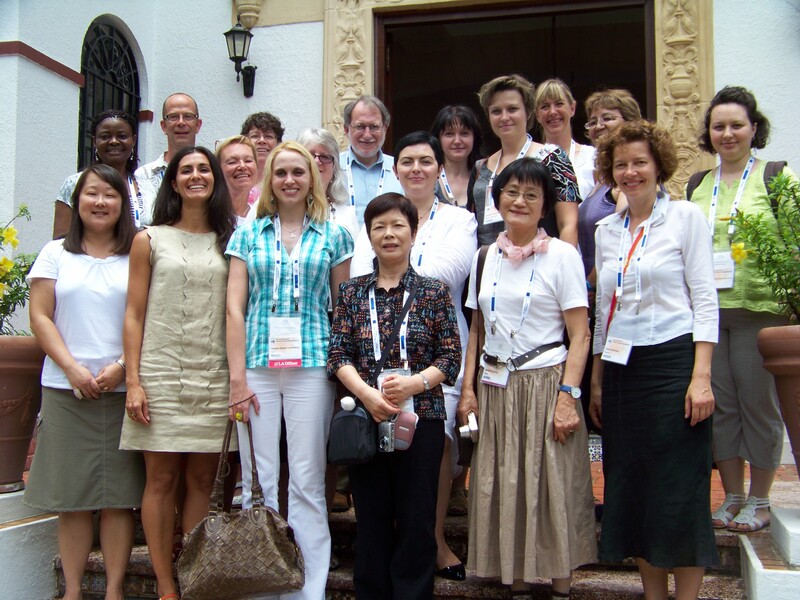 Once more, IFLA celebrated its annual conference last August, this time in San Juan, Puerto Rico. Librarians from all over the world gathered for a week for this unique oportunity to learn from other colleagues and know what the latest experiences are in other countries. As always, public libraries played an important role, with a number of sessions in which they participated. You can read many of the presented papers in the conference website. Here, you will also find a detailed account of every day of the congress, including videos, tweets, posts, pictures, etc. Last May, Bibliodef, the union catalogue for the Defence Libraries Network, was officially presented online. Bibliodef features the description and place of the bibliographic content inside the Ministry of Defence’s library network. 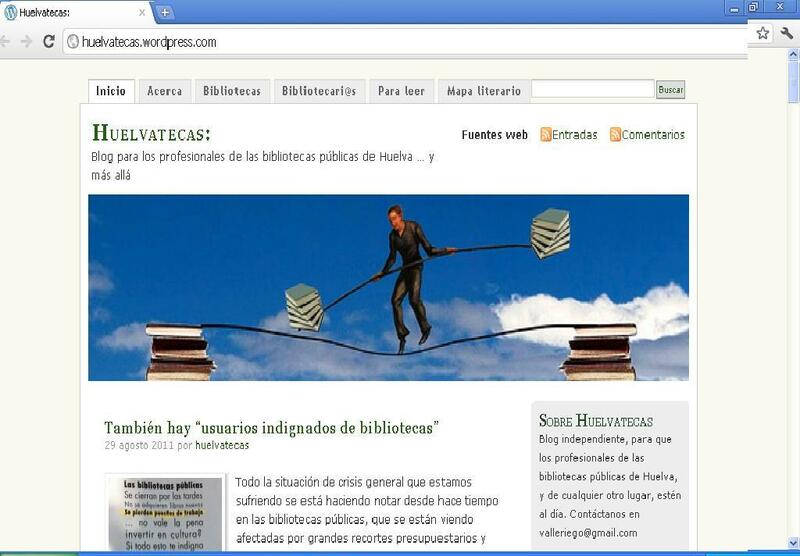 Through www.bibliodef.es, one can reach the unique source of access to the Defence Libraries Catalogue and will find all the information and location related to the documents. This catalogue, which is constantly updated and improved, includes more than 500,000 bibliographic records coming from 52 libraries inside the Defence Libraries Network, amongst which can be found the general and historic libraries; special libraries and documentation centers and school libraries. The bibliographic records integration in Bibliodef and the easy access via online contribute to increasing the bibliographic patrimony’s visibility as well as helping it spread. The third edition of the IFLA Library Services to Multicultural Populations Guidelines, published in English in its original version in 2009, is already available in 7 languages, including Chinese, Dutch, French, German, Russian and Spanish. You can find all of them here. The document is the culmination of a number of years work by members of the Standing Committee of the IFLA Section on Library Services to Multicultural Populations. The Committee regards the revision of the Guidelines as an important step in promoting the development of library services to culturally and linguistically diverse members of our communities. However, these Guidelines may be applied to all types of libraries. 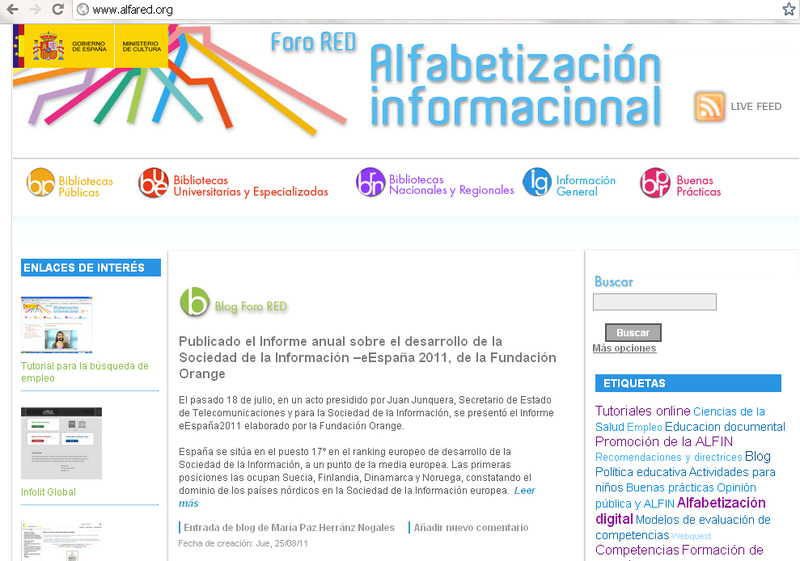 Alfared is the portal of information literacy in Spain. The website includes information about congress, conferences, guidelines, standards and best practices in public, university, specialised and national or regional libraries in Spain. 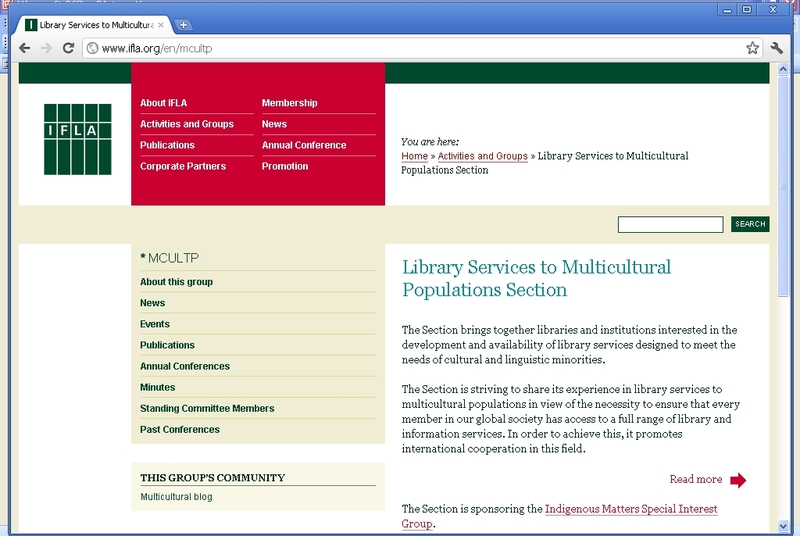 The website is coordinated by the Working Group of Information Literacy of Council of Library Coordination. You can find the last news about information literacy in the blog or you can do the Tutorial of Job searching, an interesting resource for the public libraries users.